Donald Trump recently said that Lincoln’s Gettysburg Address was “ridiculed” at the time by the “fake news” press. Mr. Trump said: “You know when Abraham Lincoln made the Gettysburg Address speech, the great speech, you know he was ridiculed. And he was excoriated by the fake news. They had fake news then. They said it was a terrible, terrible speech.” Well, I teach Civil War history, and I have a lecture that I give on widely-held myths about Abraham Lincoln, and this myth is high on my list. It is widely-believed that Lincoln’s Gettysburg Address got universally bad reviews at the time, but in reality, the reviews of Lincoln’s speech mostly fell along party lines. Republican newspapers thought the speech was great. Democratic newspapers thought it was mediocre, and predictably, Confederate newspapers thought the speech was just awful. There was one thing that everyone who was at Gettysburg did agree upon – everyone was surprised at how short Lincoln’s speech was. Lincoln only spoke for 2 minutes. Just before Lincoln spoke, Edward Everett, a famous orator of the day, delivered a speech that was 2 hours long, and most people assumed that Lincoln would speak at least as long as Mr. Everett. Here is the review of the Gettysburg Address that appeared the next day in the Providence Journal (a Republican newspaper.) “We know not where to look for a more admirable speech than the brief one that the President made at the close of Mr. Everett’s oration. Could the elaborate and splendid oration be more beautiful, more touching, more inspiring than those thrilling words of the President? They have in our humble judgment the power and charm of the very highest eloquence.” That sounds like a pretty good review to me! Lots of other Republican newspapers gave the speech their highest praise. Another widely held myth about the Gettysburg Address is that Lincoln wrote it on the back of an envelope while he was on the train to Gettysburg. That isn’t true either. Lincoln knew that this was going to be an important event with lots of famous people and newspaper reporters present. Lincoln worked on his speech for weeks. 5 early drafts of the Gettysburg Address still exist and are at the National Archives. A lot of what people think they know about Abraham Lincoln is really just a collection of popular myths garnered from politicians and movies – two equally unreliable sources of historic information. Vampire Hunting. The movie ‘Abraham Lincoln, Vampire Hunter’ has been on TV a lot lately. Just in case you were wondering, this movie is not historically accurate. At various times in his life, Abraham Lincoln worked as a farm hand, a railsplitter, a boatman, a storekeeper, a postmaster, a soldier, a surveyor, a lawyer, a state legislator, a Congressman, and President of the United States. However, I am unaware of any evidence that Abraham Lincoln hunted vampires. ‘Disruptive’ is a hot buzz word these days. You hear TV commentators and politicians using the word ‘disruptive’ all the time, but it sounds like most of them don’t know what the word means. ‘Disruptive’ does not mean ‘destructive’; however, that appears to be what a lot of people think it means. An angry child smashing the family’s porcelain dinnerware is not being disruptive. He is being destructive. So – what does ‘disruptive’ mean? The word ‘disruptive’ has 2 very different meanings, one negative and one positive. In politics, ‘disruptive’ usually refers to something bad. ‘Disruptive’ can describe a person who is undisciplined, disorderly, unruly, chaotic, or who just won’t play by the rules. For example, in the first presidential debate in 2016, candidate Donald Trump interrupted Hillary Clinton 22 times in the first 30 minutes of the first debate. Constantly interrupting somebody who is speaking during a debate is very disruptive, and in the negative sense of the word. However, in high technology, ‘disruptive’ usually refers to something good. That is because ‘disruptive’ has a second meaning. ‘Disruptive’ can refer to something new, innovative, or groundbreaking that radically changes the way business is conducted or how a product or service is produced, displacing the existing way of doing things. I was thinking about this last month at the annual BoxWorks conference in San Francisco. During his keynote address, Box CEO Aaron Levie interviewed Brian Chesney, the founder of AirBNB. Both of them referred to AirBNB as a ‘disruptive business’, and it is. Mr. Chesney created a new business model for temporary housing that was cheaper for travelers and that provided new income for property owners. However, as a result of this, established hotels and motels lost a lot of business. This is an example of ‘disruption’ in the positive sense of the word. The next time you hear someone on TV using the words ‘disruptive’, ‘disrupter’, or ‘disruption’; think about what he means. If he is using the word in a story about a politician, it almost always means something bad. In high tech, it almost always means something good. Auto Antonyms. There are a lot of words like ‘disruptive’ in the English language, words with 2 very different and sometimes opposite meanings. An auto-antonym is a word with 2 opposite definitions. My Uncle Maurice got me interested in auto-antonyms a long time ago. Consider the word ‘citation’, which is an auto-antonym. A citation can be a an award for good behavior ‘The Boy Scout received a citation for saving the drowning camper’ or a penalty for bad behavior ‘The policeman gave the driver a citation for parking in a bus stop.’ Words with 2 opposite definitions creates a lot of confusion and and sometimes start pointless arguments. Baltimore Sun Article on Kushner. Donald Trump also uses this same practice in his business, having people arrested and sent to jail for non-payment of rent. The penalties for non-payment of rent have been much harsher at various times in history. For example, in ancient Rome, a landlord could have a tenant sold into slavery to recover unpaid rent. Incredibly, there are some places in Asia where this practice is still going on. In medieval England, if a serf’s house burned down, he was still obligated to pay his landlord the same amount of rent, and if he refused to pay the rent or ran away, he could be hanged. Now just in case you were wondering….In California, you cannot be arrested, sent to jail, hanged, or sold into slavery for non-payment of rent. However, you can go to jail in California for biting your landlord. That’s assault. When it Used To Snow In San Francisco. Donald Trump and a majority of the Republicans in Congress say that global warming is a hoax. Whenever I hear politicians say that, I think about photographs like this one. Its a photo of Market Street in February, 1887. People are in the street because the snow had shut down the cable cars and street traffic. 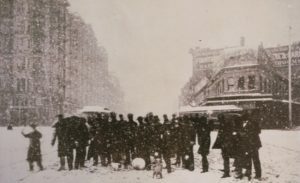 Did you know that back in the 19th Century, it used to snow in San Francisco? Not frozen dew or a light dusting, but real snow. You can see old photographs of San Francisco blanketed in snow on Google Images. 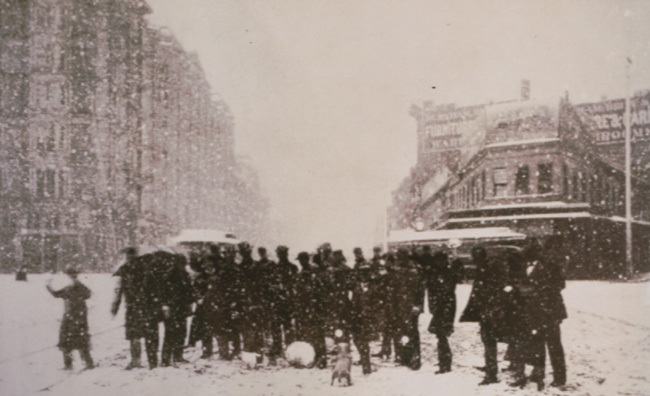 For example, on New Year’s Eve in 1881, snow began falling in San Francisco. It snowed continuously for the next 5 hours. The following day, the San Francisco Chronicle reported that telegraph and telephone service was interrupted throughout the city because of downed wires and fallen tree branches. Boys and girls had the day off from school. They built snowmen and had snowball fights all over the city. Many of the palm trees and flowers in the exotic gardens in Golden Gate Park were killed by cold and the ice that covered them. Now I have lived in Berkeley for over 40 years, and I have never seen snow on the ground here. The last time it snowed in San Francisco was 1976. The city got 1 inch of snow, and the next day, it was gone. San Francisco is not alone. There are many places around the world that used to regularly get snow but don’t anymore. The Irish Potato Famine. Hundreds of thousands of people died in the Irish Potato Famine. The potato crop failed in 1845 due to a disease called potato blight. The disease spread quickly, destroying nearly all the potatoes in the country. By 1846, people in Ireland were in a bad state of affairs. Even before winter arrived, millions were weak from hunger, and to make matters worse, a lot of people had sold their winter clothing and shoes to buy food. Winter came early in 1846, and the winter that year was bitterly cold. Snow started falling early, and it kept falling. In some places in Ireland, snow drifts were 10 feet deep. People living in remote areas, already weakened by hunger and cold, were unable to get to one of the few food relief centers in Ireland because snow blocked their way. Here is a letter that was written by an English observer in Ireland at the time and that appeared in a London newspaper in 1847. “Among the thousands I meet, I have seen no one who had clothing corresponding to the bitter cold which is now experienced; on the contrary what is beheld is emaciated, pale, shivering, worn-out farming people, wrapped in the most wretched rags, standing or crawling in the snow, bare-footed and freezing.” People who live in Ireland today find it hard to believe that they ever had winters like that, but then – people who live around here are often very surprised when I show them old photographs of Market Street in San Francisco covered in snow. The Northwest Passage. I used to know a magician named Dan X. Solo, a very nice guy. For over 20 years, Dan worked on cruise ships that went up the west coast to Alaska. Dan did table hopping magic and magic shows aboard these ships. Dan used to tell me that global warming was very obvious to him – and profitable as well! That was because every few years, the Alaska cruise ship season got a little longer, and that was because the seas in the Alaska inner passage were ice-free longer every year. Dan said that when he first started working on cruise ships, the Alaska cruise ship season was from June to August, but when he retired, the season was from May to September. The season had gone from 3 months to 5. Since Dan Solo’s death a few years ago, the Alaska cruise ship season has gotten even longer. And now, cruise ships are traveling from Alaska to New York through the Northwest Passage. In September, the cruise ship Crystal Serenity arrived in New York City from Vancouver, Canada across the Arctic, a trip that was unimaginable just 20 years ago. The voyage took 28 days. The passengers were not ‘roughing it’ through the Arctic. The Crystal Serenity has 13 decks, multiple indoor swimming pools, a casino, movie theater, a spa and health club, a golf driving range, and 6 restaurants. The ship actually has 12 restaurants if you include the specialty restaurants like Silk Road and the Sushi Bar. The ship has an herb garden and olive trees aboard the ship so diners will have fresh ingredients. Each passenger paid between $20,000 and $120,000 to take the trip. Many more Northwest Passage trips are scheduled for 2017. Evidence of global warming is not hard to find. It is everywhere. It is not surprising to me that all of the politicians who say that global warming is a hoax get big bucks from oil and coal companies. “It is difficult to get a man to understand something when his salary depends upon his not understanding it.” – Upton Sinclair, 1935. Donald Trump. When Barrack Obama first ran for president in 2008, Donald Trump claimed that Obama did not meet the Constitutional requirements to be President of the United States. Because that became a major issue in the election, I gave my history students a class on the Constitutional requirements for the job of president. I plan to give that class again later this month because the birther issue is back in the news. Ted Cruz was born in Canada, and because of that, a number of people (including some famous experts on Constitutional law) have questioned whether Ted Cruz is qualified to be president. Here is what I told my students in 2008. There are 3 requirements for the job of President of the United States in the U.S. Constitution. The president must be 35 years of age. The president must be a natural born citizen. Birth Certificates. You will notice that there is no Constitutional requirement that the president has to have a birth certificate. You sometimes hear people say that the president has to have a birth certificate to prove that he was born in the United States, but that isn’t true. Although it is now standard procedure for someone to issue a birth certificate when a baby is born in a hospital in the United States, very few people prior to the 20th Century had birth certificates. Most of America’s 18th and 19th Century presidents were born at home, and on farms or on the frontier. There was nobody present when they were born to issue a birth certificate. The first U.S. president to be born in a city was Teddy Roosevelt, and he was a 20th Century president. We know that George Washington did not have a birth certificate. Neither did Thomas Jefferson, Andrew Jackson, or Abraham Lincoln. There is nothing in the U.S. Constitution about birth certificates. Natural Born Citizen. The Constitution says that in order to be a senator or congressman, you merely need to be a citizen, but in order to be president, you have to be a natural born citizen. What’s the difference? Nobody knows for sure. The Constitution does not define the term ‘natural born citizen’. Congress has never passed a law defining this term, and the Supreme Court has never made a ruling on this issue. A number of people have run for president who were born in foreign countries, but none of them won, so the Supreme Court never heard a test case about this question. Below are the names of some of the men who ran for President of the United States, but who were not born in a state. John McCain was the Republican candidate for president in 2008. He born in the Panama Canal Zone, which never part of a state. McCain came very close to getting elected. He got 48% of the popular vote. Al Gore was born in Washington, D.C., which is also not a state. Barry Goldwater was born in Arizona, but when Arizona was a territory, not a state. Lowell Weicker, the Governor of Connecticut, ran for president in 1980. He was born in Paris, France. Is Ted Cruz A Natural Born Citizen? If Ted Cruz is elected president, the Supreme Court will undoubtedly be immediately petitioned to decide whether he is or isn’t a natural born citizen. Ted Cruz could have a problem. The Panama Canal Zone was under the jurisdiction of U.S. law when John McCain was born there, and Washington, D.C. has always been under the jurisdiction of U.S. law. However, Canada is a foreign country and has never been under the jurisdiction of U.S. law. Also, both of Ted Cruz’s parents applied to vote in Canadian elections. That could be a big problem for Cruz. There is a long established legal principal that says that if you are a U.S. citizen and move to a foreign country and vote in their elections, that is evidence that you no longer consider yourself a U.S. citizen. Is Ted Cruz qualified to be president? A number of famous legal scholars have written articles on this subject. Some say that Ted Cruz is a natural born citizen. Others say he isn’t. If Ted Cruz is elected president, the Supreme Court will have to decide the question.